I was sold on this book when I read the synopsis. I had no idea how much better the story would be than the synopsis could portray. I love complex epic tales where “the little guy” has his life thrown into chaos by some mega-sized entity, where there are many characters that all play a role and have such distinct personalities that you have no trouble remembering who is whom. The last epic of this caliber that I read was “The Gap Series” by Stephen R. Donaldson. 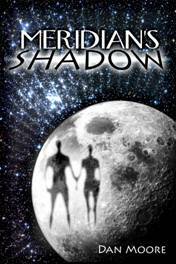 “Meridian’s Shadow” is that kind of epic tale. The tale begins slowly as the myriad characters are introduced and their relationships are developed. We meet the Logans and their team of scientists who have created nanomachines that can be programmed to clean pollution and other environmental contaminants. But prior to programming, they are indiscriminate destroyers. This is merely a temporary state to the scientists, but it has much more potential as a weapon to Amos Cross, the ruthless CEO of the mega-sized Meridian Corporation. Cross will stop at nothing to get his hands on the nanomachines. At the same time, another powerful and equally ruthless entity sees the machines as an unnatural abomination that must be destroyed at all costs. The well-intentioned Logans and their team are caught in the power struggle. Their only hope is to find a way to stop the nanomachines. But can they do it as everything falls apart around them? Dan Moore apologizes at the beginning for any spoofed science, but he does a wonderful job keeping the science real. I particularly liked that space felt “big”, with spacecraft taking months to reach the asteroid belt. There was also a feeling of being in the midst of technological progress as the first space elevator goes into operation during the story and there is mention that technology had not yet been able to place singularity-based communications aboard spacecraft. All the players in this story have such an amazing depth of character that they jump right out of the page and easily become real people in the reader’s mind. Much like in real life, they all have flaws and quirks that drive their motivations and, more often than not, the twists and turns of the plot. Hunter Logan with his implicit trust; Robert Hastings’s overwhelming despair over the death of his wife and son; Jo Smith and Tyson Edwards and their devotion to family; Susanne Frost and her need to please men. All unforgettable characters. “Meridian’s Shadow” delivers suspense right to the end. Yet a single thread is left hanging leaving a path open for a sequel. And that’s a sequel I’ll be sure to read! For more information including a list of the rest of the upcoming books in series, check out the “Meridian’s Shadow” page here or visit Dan Moore’s page for more about the author and his other works.